Gabon Political Map vividly shows the provinces, cities, provincial capitals and the national and international boundary of Gabon. The country lies between Equatorial Guinea and Republic of the Congo and covers an area of about 267,667 sq km. Some of the major cities are Mekambo, Bogonville, Bitam, Sette Carna and Akieni. Libreville is the capital city of Gabon. Gabon, located in Western Africa is situated between Equatorial Guinea and Republic of the Congo. It covers an area of 267,667 sq km and falls on the coordinates of 1° South and 11° 45' East. Gabon forms the border with Atlantic Ocean at the Equator, Bight of Biafra and Corisco Bay. Cameroon is located to the north of Gabon. 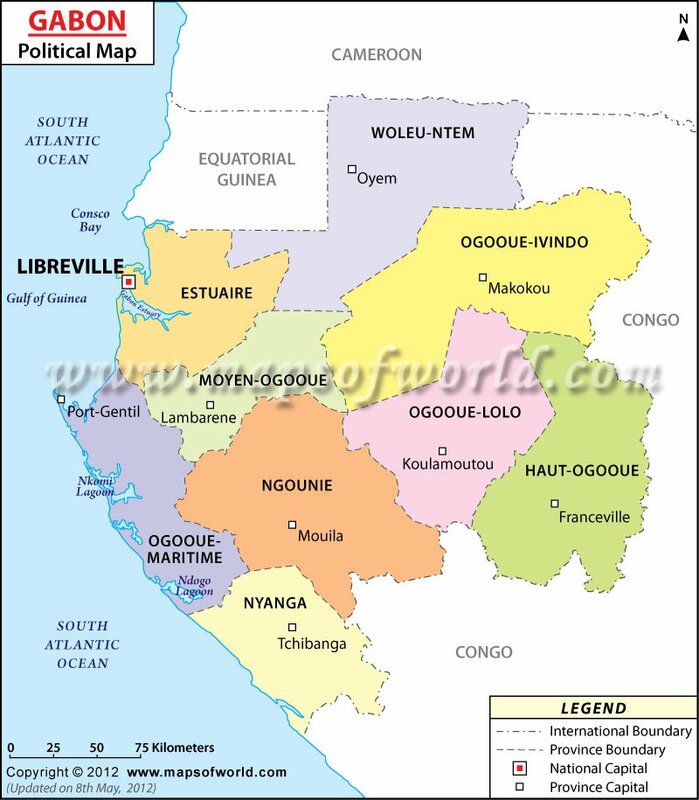 Gabon Political Map provides an in-depth knowledge about the provinces, cities and the provincial capitals of Gabon. Bitam, Minvol, Mitzic, Lara, Edoume, Mazingo, Mekambo, Ekata, Mayebout, Ovan, Booue, Ndjole, Befoun, Akok, Kougouleu, Ntoum, Kango, Owndo, Foulenzem, Yeno, Ndougou, Omboue, Iguela, Sette Carna, Yombi, Fougamou, Mimongo, Mbigou, Lebamba, Malinga, Ndende, Moabi, Bounda, Mayumba, Moulengui Biza, Lastouesville, Iboundji, Pana, Pkondja, Lekila, Akieni, Mounana, Moanda, Bakoumba, Boumango, Ngouoni, Bogonville and Lekoni are some of the major cities located across Gabon. All these cities are shown on the Gabon Political Map by black dots. Libreville is the national capital of Gabon and is located on the geographical coordinates of 0° 22' 60" North latitude and 9° 26' 60" East longitude. This place can be easily accessed from the cities and towns of Quaben, Ntchogo, Nomba, Adzebe, Lalala, Pointe Denis and Atonda-Simba. Libreville Leon is the nearest airport of Libreville. The capital city can be easily identified on the Printable Map of Gabon by a red star. The provincial capitals are shown on the World Map Gabon by green squares. The national boundary is marked with a red uneven line and the international boundary is shown with a black irregular line on the Gabon Map.